I arrived at Charles De Gaulle airport yesterday around 10:45am. I had attempted to get some sleep on the plane and brought an eye pillow, in the hopes of showing up ready to paint Paris red. But who was I fooling? I had run myself ragged for two weeks before leaving, feeling overwhelmed with all the things I needed to do, and preparing for being away for three weeks. And my body was aching so badly, I needed to get a two hour massage the day before I left just to be able to function. In short, I got off the plane and quickly met Dan, who was already in Paris for two weeks attending French immersion school, and he was in good spirits, eagerly awaiting my arrival. We greeted each other with warmth and excitement and headed back on a train into Paris. The train station, Chatelet Les Halles, is part of this underground mall I had read about. The best part about being in this gargantuan underground mall first thing is that I knew our time could only get better. Honesty, it was a pretty gruesome sight. However, we emerged on the street and it was sunny and warm and there was activity buzzing all around us. It was a contagious feeling and we enjoyed our .6 mile (1 km) walk to the Marais, passing outdoor marches (markets) en route. As soon as we got inside the apartment, my plans for the day shifted. I sat on the bed, declared that I needed a nap for at least two to three hours, and told Dan I hope he enjoyed himself and all that Paris had to offer him for the afternoon. Soon after we arrived we had discovered that the heating pad I brought from the states wouldn’t work here and he was kind enough to go on a mission to finding one for me (which was a feat in and of itself, since they are not sold at drug stores or medical supply stores). He came home before five with heating pad in hand and woke me up and we chatted and had a relaxing time getting ready for the evening’s festivities. It was a bit ambitious to have dinner reservations for my first night here, but there are so many amazing restaurants in Paris, we had a hard time narrowing them down. This combined with being hedonistic foodies, resulted in having a dinner planned for every night were in Paris. We walked to Kei, an Asian-French fusion restaurant not far from the Louvre. On route, we walked down Rue de Rivoli, which is home to Hotel de Ville and Paris’ City Hall (each arrondissement has its own city hall and then the city has another one which is even more regal than the rest). 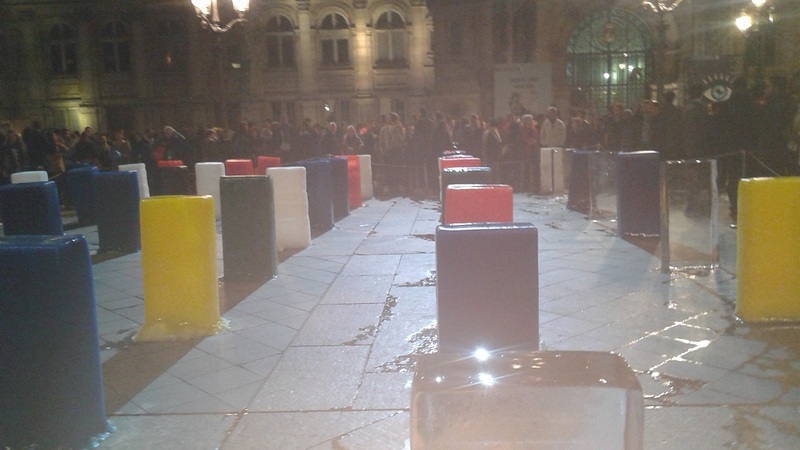 There were crowds there, gathering for the festivities of Nuit Blanche, a once a year event where public art is displayed spread out through Paris and the subways stay open all night. 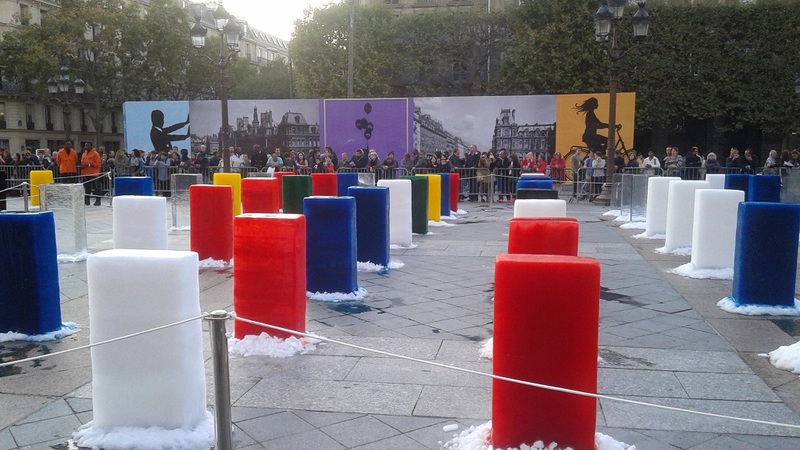 The major attraction at the Hotel de Ville was a set of ice sculptures – colored blocks – that represented the countries of the world. We checked them out and then made a note to revisit after dinner. 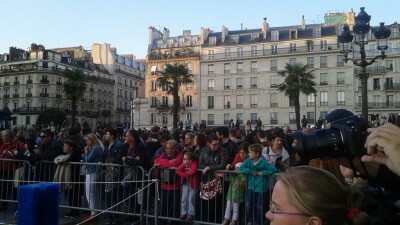 We also stopped to watch some street performers who had a great show going involving lots of audience participation. They were really a high energy group. After hanging for a while we continued toward Kei. 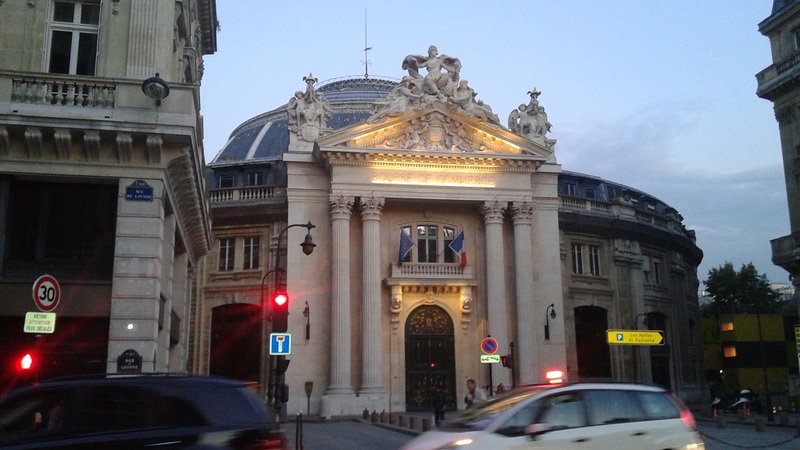 Dan pointed out the building which is the home of the French Stock exchange – it is ornate, but rather modest compared with NYC’s. Kei opened just at 7:45 and we were the first ones seated. The restaurant has twelve tables that seated two people a piece, at least on this evening, so it was very intimate. The entire inside was decorated in all white, which maintained an air of elegance. The chandelier stood out in the room and for sure, was a showpiece that was very eye catching. The setting was very soothing and relaxing and it didn’t take long, before we realized that the service would be completely impeccable. The menu did not state what food would be served, except for the main course. There were two choices of menus, and we selected the one that would have beef for the main course. There was actually a large cut of the beef sitting on the table under the chandelier and the waiter carried it to our table and told us about it. The waiter stressed that each dish is a specialty of the chef and it is best to trust the chef, which we did, as we never would have gone there to eat if we didn’t. Plus, we liked the idea of being surprised! There was also a man, the sommelier, whose entire job is to educate and help select and pour wine for the patrons. I smiled, as he would direct us to getting as much wine as we could handle. We started with champagne, had a glass of white wine with the fish dishes and a red glass with the beef. It was obvious he very much enjoyed his work and describing the wines. I don’t normally indulge this much, but I wanted to make sure I got knocked out for the night to relax my muscles. 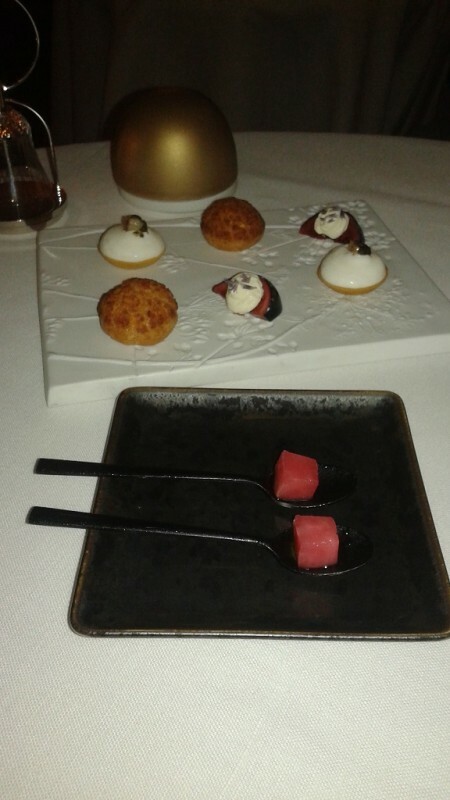 The amuse bouche included shiso sorbet, figs with fromage blanc, and a cracker with fish custard of some sort. The first dish was sturgeon caviar from China with creme fraiche on top. I absorbed the salty flavors from the sea with ease and immediately felt my body absorbing the nutrients. The next dish was perhaps the prettiest salad presentation I had ever seen. 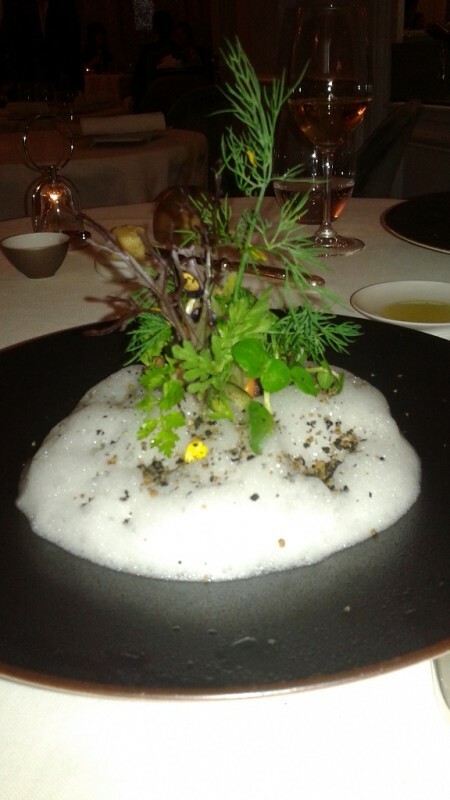 A bowl with foam and the veggies expertly arranged to be sticking out like a forest. We were instructed to mix it all up before eating it. I suspect the foam had fat in it and it acted like a dressing, to coat and make the veggies more digestible. It was amazing for the palette and I didn’t leave a drop of it in the bowl. The next dish was very simple to look at and it too was to die for. An artichoke heart, which was stuffed with a cooked wild mushrooms, and then the whole thing was fried in a very light batter. Every bite was savored. 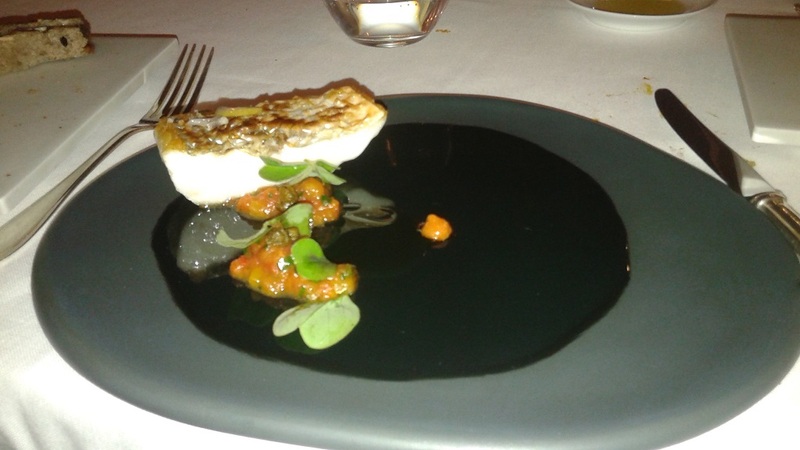 Next was the sea bass, prepared perfectly. It was tender and moist, and the skin was salty and crunchy. It was cooked with the skin face down, and then at the end, flipped over, and broiled quickly. The result was a fusion of textures and a pure delight. The next fish dish was two shrimp, expertly placed on the plate, accompanied by three different sauces, in varying proportions – a dot, a spoonful and a dollop. The main course arrived. About two ounces of expertly prepared beef, it was almost seared, and, for me, the perfect amount of rare. 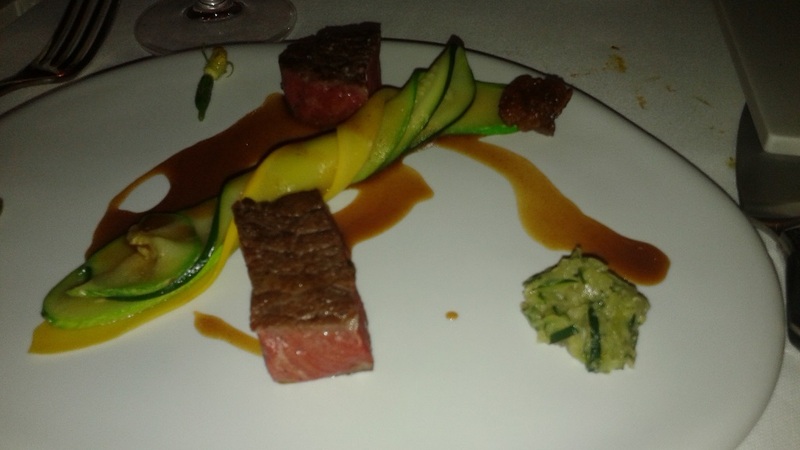 The accompanying zucchini was stunning – it was sliced the long way and twirled around the other slice (one green, one yellow). We commented that it needed to be not too soft (or it would fall apart and be mushy) and not to hard (or it would not mold to the necessary form). It tasted perfect. Then came the cheese and desserts and, I have to say, I loved that there was very little sugar in them. A cream or foam of Gorgonzola with olive oil and pepper in a nut tart – I am not sure how the cheese flavor was infused in this foam, but it was light and fluffy and went down with ease. 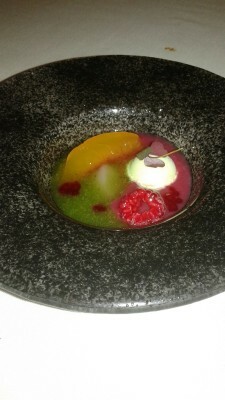 Then a mélange of fruit preparations (raw fruit, sorbet, gelee), with a bite (literally, a bite) of basil ice cream. 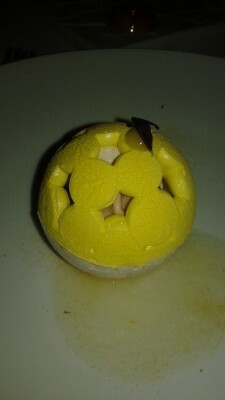 And the last dish was made with yuzu, used a lot in Asian cooking, along with meringue and chestnuts on the inside. The entire meal was perfectly balanced- flavors, colors, densities and any other way food can be measured. The service was superb. It couldn’t have gotten any better. And at the end of our meal, our waiter said he was going to see if the chef was available for us to meet. I think he went this extra step, because we showed so much interest in the food, as well as we were the last ones to leave (even though we were also the first ones to show up). While we were waiting for the chef to come out, I inquired about other than Kei, what were some of his favorite Michelin starred restaurants in Paris. He wrote down the names of a few of them. One never knows when they may find their way back to Paris, and be on the hunt for amazing food. After a brief meet and greet with a surprisingly young chef Kei, our walk afterwards felt wonderful. The meal was not overly heavy, but still, it warranted getting the blood moving. 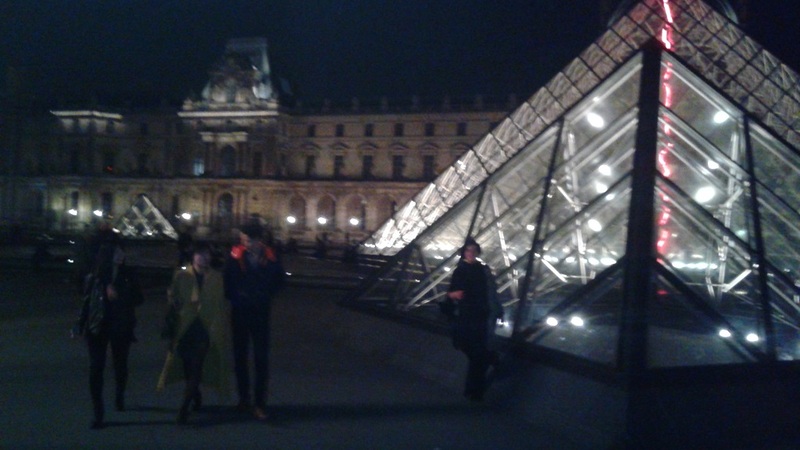 We walked to the Louvre and admired the architecture. It was originally built by Phillip II in the 12th Century as a fortress and apparently some remnants of the original still exist. I thought it looked like a miniature Versailles – the fence and the layout of the main building. The inside courtyard was lit up and we stood witness to the glass pyramids that have come to mark the Louvre in recent times. Perhaps someday I will go inside, but it is almost always so crowded and it takes so much time to enter – three hours is not uncommon – that for now, I was more than content to just see it from the outside. We walked home and although some of the festivities of Nuit Blanche were done, some were still in full swing. Outside the city hall, we stopped to see the ice sculptures and see how much they had melted since before we went to dinner. There were 256 of them, one for each country and in different colors. When they melted, it was an expression of global warming, as well as all the colors blending into one, to symbolize harmony on the planet. Back home, my jet lag was setting in again. Dan and I spent a few minutes expressing our joy about manifesting an amazing adventure, our love for Paris, and how happy we were to be there with each other. Then it was lights out! Thanks for posting this. I loved my brief visit to France, and I’m hoping to go to Paris some day.